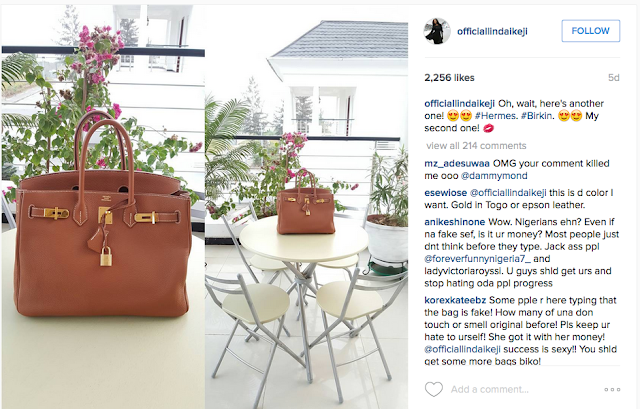 Hermes Confirms Linda Ikeji's Handbag Is Fake! The uproar raised by Linda Ikeji's fake Hermes handbag looks to be coming to an end with this response from Hermes. Linda vehemently defended her birkin bags and talking about how her banana island mansion costs half a billion Naira. The blogger bragged and boasted about how she can afford a Birkin and has refused to admit that she has been cheated by whoever helped her purchase the bags even after Hermes Confirmed the bags are fake, ngtredns reports. To underscore her assertion, she said she waited in line for 8 months to get her Hermes bag. When pushed further, she locked her page. But a Nigerian who doesn't want wahala, DMed Hermes through their official IG handle and got a reply. Hermes says the bag pictured below, is a counterfeit..